The use of satellite images for mapping and analyzing linear structures and fracture systems in subsoil regions is essential to understand the subsurface groundwater path ways and traps. In this study, we apply Optimal Index Factor (OIF), principal component analysis (PCA), and directional filtering (Sobel) of several Landsat 8 bands for the wooded Waddai area in NE Chad. The application of the Sobel directional filter to these bands showed a robust performance for enhancing the discontinuity features and allowed better identification of the fault/fracture systems by the automated lineament extraction techniques. 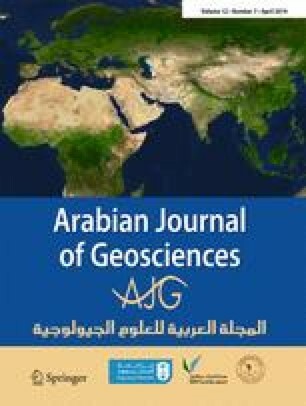 The results indicate that the ENE and WSW structural trends control the distribution and migration of groundwater, in good agreement with previous hydrological studies and published hydrogeological maps. New highly potential areas for groundwater exploration are identified on a lineament density map and verified by ground truth urban distribution. We acknowledge the support we received from colleagues in the Geology and Oceanology Laboratory, Faculty of Science Tetouan, Abdelmalek Essaadi University. The authors would like to thank Dr. Waleed Lagrab (Abdelmalek Essaadi University) for the technical assistance and guidance. Basem Zoheir likes to acknowledge the help offerred by Bill Hauer (NASA) to obtain the staellite data. Tow anonymous reviewers are thanked for their constructive comments that helped in imporving this first draft of this manuscript.